We Indians are fans of sweet. Sweets have always been an integral part of our lives and from ages. If a new baby is born, we celebrate that joy with sweets. If a child in one’s house is passed with flying colours, the mother makes sweet. All our important festivals be it Diwali, Sankranti (the kite festival), Holi (the festivals of colours) have sweets included and have their specific significance. Even on every New Year we eat sweets. The New Year marks a new sweet beginning. We love to eat chocolates too. For that matter we even eat ‘Paan’, after the meal which is said to be good for digestion, which is also sweet. So having heard of so many situation that we have sweets, one can imagine what kind of die-hard fans we are. You’d find a sweet shop in every corner. That’s how obsessed we Indians are. 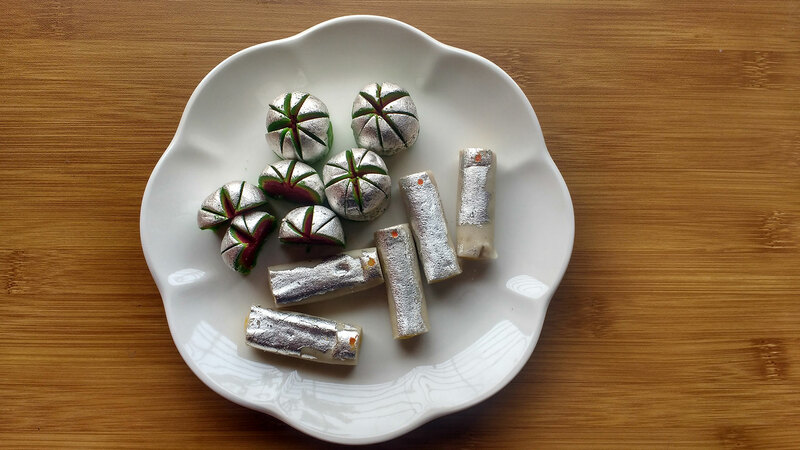 Sweets include sugar, dry fruits, dairy products which are cooked and from this many variety of sweets are made of different forms, sweetness level and shape. The more creative the shape and form, the more attractive the sweet looks. I like the idea of celebrating buying a new car with sweets 😊 I love sweets too. I bet, you do. Well, that’s the level of craziness and we love it. 😊 Thank you for reading. Such unique sweets! I’ve never seen anything quite like them before. I wish I knew how they were made.